Good point! That's a possibility. Because I mentioned on a post in May that a similar thing happened at North Philadelphia. A person was struck at that station, and only local tracks were used. However here are some differences. 1) When I caught the Northbound local from Spring Garden back to Cecil B Moore, the local stopped at Girard. This was within mere minutes of my Southbound express train skipping Girard. 2) When there are fatalities or crime scenes, all trains either bypass a station or terminate before reaching it. I didn't notice any sort of "clean up crew" or authorities at Girard. When the person was struck at North Philadelphia I remember seeing a number of people with yellow jackets/vests on the platform and northbound express track. My heart goes out to whoever is involved in those incidents. I just doubt that a fatality or heinous crime occurred at Girard that day. I may be wrong though, I wasn't thinking of checking out the news that day. I was still annoyed at being late to my 8AM class , even though my instructor was otherwise fine with me being late just 1 time. Kinda tying back to my question about maintenance men in the tunnels, and how well they're protected. I noticed for the past few weeks, the northbound express track between Susquehanna-Dauphin & North Philadelphia has been having some sort of maintenance take place. I saw 4 type of signs in the northbound express trackbed. Typically after seeing an A, S, or R sign a STOP sign would follow. Then a maintenance man would appear from the darkness, remove the STOP sign, then flash his light up & down. After that the train would sound its horn & proceed. All while the signals displayed clear, similar to this video around the 5 minute mark ( https://www.youtube.com/watch?v=bB8Bby_sNGU ). - What do the A, S & R signs mean respectively? Whenever one pops up in sight the train sounds its horn and slows down. - Why don't signals show yellow and/or red when maintenance men are in the tunnels? - I notice that the signals display yellow & red that to prevent speeding, but they tend to display clear when maintenance men are in the tunnel, why is that? I know it's been a little while since the last post in this thread. However I was scrolling through YouTube and I found something quite interesting. Remember the time I spoke of the 2 express trains running parallel earlier in the thread? I found a video of it on YouTube, pardon the cursing. Any idea why this takes place? I thought it only happened to me once, but it seems to have taken place at least one time since. It probably happens once in a blue moon, but still. It just seems super redundant to have 2 expresses run parallel to Walnut-Locust, tying up 2 tracks the entire time. I wonder what happened when the trains reached Walnut-Locust, did one become a deadhead to Pattison/AT&T? Who knows. Also as a sidebar I notice at least during the morning that there's ongoing track maintenance on the southbound express track from Spring-Garden to Race-Vine/City Hall. Like right before the platform at Spring-Garden there's a sign in the tracks and the motorman sounds the horn for a few continuous seconds. Then approaching Race-Vine there's always a STOP sign in the track, forcing the motorman to sound the horn and stop the train. It was a tad problematic today as there was a southbound local simultaneously arriving. So the maintenance man had to wait for the local to pass to remove the sign, I assume because there's barely any standing room between the tracks. Plus both trains were repeatedly sounding their horns, felt kinda bad for the maintenance man. Two giant subway trains approaching with their horns sounding and having to find somewhere to stand to let them pass. I saw a video a few days ago about Philadelphia in the 90s. In that video there was a shot of a Ridge-Spur train at 8th and Market and it displayed "Girard" as its end point. What was up with that service? silverliner266 wrote: I saw a video a few days ago about Philadelphia in the 90s. In that video there was a shot of a Ridge-Spur train at 8th and Market and it displayed "Girard" as its end point. What was up with that service? Ridge-Spur trains used to only run Girard-8th/Market. Not sure when they made the change to run all the way to Fern Rock. I think by the 90s Ridge-Spur trains ran from 8th & Market to Erie at least as locals. Then following Railworks in the 90s the Ridge-Spur trains ran from 8th & Market to Olney (Fern Rock on occasion) but as expresses, with an additional stop at North Philadelphia. The Bridge trains (DRPA/Pre-PATCO) trains did terminate at Girard however, but that was way before the 90s. Today (12/7) I boarded the 10:01 AM southbound express at Olney. Everything went well till after Erie. Shortly before Allegheny there was one of those "A" ,"S" , or "R" signs in the track and the train instead of operating at MAS, operated at a slower speed, it felt like restricting. As I had somewhere to be, this was annoying. However to make matters worse, as we were approaching Girard, shortly after passing Cecil B Moore an alarm went off. It sounded like a fire alarm, which was weird because the train didn't pass any red signal or anything. I never heard anything like this before on the BSS, or any train ever. Come to think of it, I don't think I've been on a train that blew through a red signal. Seconds later a woman comes running frantically and begins tapping on the motorman's window. At this point the motorman stops the train, exits the cab and asks what's wrong. The woman explains that a passenger is having a seizure in the train a few cars back. The motorman says that she'll pull the train into the station and call for the paramedics (to be clear the motorman was a female, I guess I should use the term train operator). So our train reaches Girard and the motorman declares the train OOS, exits & locks the cab. Then runs back to the car with the person having the medical emergency. Minutes later a southbound local that we met initially at Erie pulls into Girard and a passenger tells the motorman of the local what happened. At that point the local motorman tells the people on the platform to board his train as the express is now OOS. Out of curiosity, what happens in an event like that? Does the trainset deadhead to Walnut-Locust or reverse direction and take the double crossover to deadhead to Fern Rock? Also what happens to trains behind it? Like do expresses & spurs just crossover to the local track near there? Because this wasn't a 12-9, just a thought. I don't think Girard itself went OOS, as stations go OOS typically for a heinous crime or 12-9. In all I hope that person is ok. As annoyed as I was initially at the train nearly making me late, the experience made me more thankful for what I have. As I was trying to get somewhere on time, someone else on the same train was fighting for their life. I hope that person gets well soon, all the best to them. NortheastTrainMan wrote: However to make matters worse, as we were approaching Girard, shortly after passing Cecil B Moore an alarm went off. Sounds like pulling that alarm actually delayed medical help because the train stopped between stations. It has been a while since I've been on the BSL. Is there just an emergency brake type system or a contact the operator button? Time flies, pardon me just getting back to you. It appears to be an emergency brake type system. It wasn't clear that the operator was contacted remotely, not sure on that. 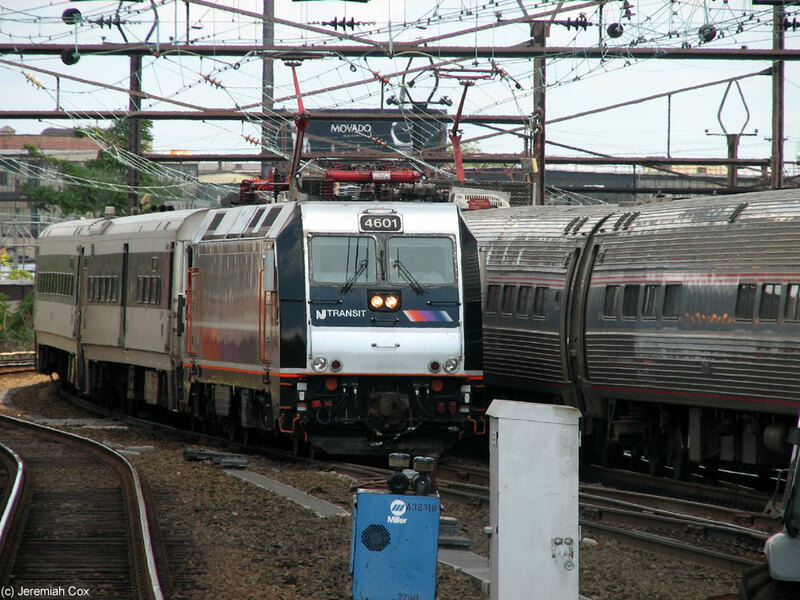 Yesterday 5/18 I saw two deadhead trains around 11AM at Olney. One passed on the local southbound track around 11:21AM. As I was waiting for my 11:25AM Southbound Express, I heard a horn and saw the green express lights. However, that turned out to be a deadhead also, but it was only two cars long. Pretty weird. Around 11:26 or so my express finally arrived. As we made our way down we caught up with the local deadhead before Erie, then after the station stop we completely passed it around Allegheny. When we got to Girard we caught up with an in service southbound local. As the Southbound Express reached Walnut-Locust the Southbound Local pulled in right after, which I boarded. As the Southbound Local left I saw the 2 car deadhead from earlier sitting on one of the express tracks, with a couple maintenance men around it. Then finally when I got off in South Philly, the deadhead that was on the local track rolled through the station. Any idea what those trains were for? The 2 car train seemed odd to deadhead to Walnut-Locust instead of somewhere on the Ridge-Spur. Also I assume that the southbound deadhead went to AT&T/Pattison. Were those trains for training? The Ridge Ave Spur uses two-car trains. chuchubob wrote: The Ridge Ave Spur uses two-car trains. On 5/18 (Friday) I saw a two-car train with green lights deadhead through Olney. It even came from around the curve as a opposed to the ramp that the Spur trains normally use. The train had its interior lights cut off, and proceeded on the Southbound Express track, I assumed it was going to 8th & Market even though it had the green lights on instead of the yellow lights. However when I later caught my Southbound Express to Walnut-Locust and then boarded a Southbound Local to complete my trip, I saw that same two car set sitting on one of the express stub tracks south of Walnut-Locust. Plus there appeared to be maintenance men around it. I'm quite familiar with the trainsets on the BSS, so no confusion there. It just seemed weird to deadhead a two-car set to Walnut-Locust instead of 8th & Market. In all fairness I could possibly be wrong on if the two-car set at Walnut-Locust was the same one I saw at Olney, given that my train was behind it I'll give it benefit of the doubt. Either way it's out of the ordinary. Also as a sidenote I notice that Ridge-Spur (two-car) trains operate in revenue service with the green lights instead of the yellow lights on occasion. I see it most notably on Saturdays. I'm not sure if this is done on purpose or by mistake. I've seen supervisors tell motormen to switch their lights because they (motormen) were incorrect. Anyways this past Saturday July 7th I had to go to Snyder on the BSL. As we were pulling into Snyder the automated announcement came on and said that the train was out of service. I thought that was rather weird. As I stepped off the motorman shut the headlights off and turned the trailing lights on. Then I looked at a sign posted on the platform that BSL service on July 7th and 8th would be terminated at Snyder as construction will take place between Snyder & AT&T (Pattison). I found this rather interesting as this is the first time I ever saw a train terminate at Snyder and change ends. I know Snyder was the southern terminus prior to the extension to Pattison which is now AT&T. However when I started riding the BSL, Snyder already a thru station. It was cool to see a train actually use the crossover north of Snyder for once. Any word on how extensive the construction was? Or what exactly they were doing? Like why not single track it instead?